Hello again faithful sci-fi fans. We’re almost to the end of the Storming The Castle Movie Scenes list. There are only two more after this one. This week, I want to share one of my all-time favorite movies. I have watched this movie so many times that I know almost all of the dialogue and most of the fight scenes by heart. My mother took me and the rest of our girl scout troop to see this when it first came out in theaters in 1983. Of course, I was ecstatic. 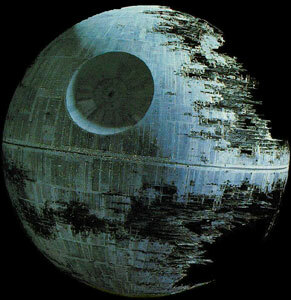 This scene depicts the space battle to destroy the Death Star…again. Emperor Palpatine, A.K.A. Darth Sidious, has built another potentially formidable weapon. You would think he’d learned from the first Death Star destruction. But no, in his arrogance and egotistical, maniacal desire to rule an entire galaxy, he creates another moon base. And the Rebels don’t hesitate to take it out with extreme prejudice while Palpatine is on board. I love this scene because of the amazing graphics, great dialogue and, well, who doesn’t like a scene full of explosions! There are actually four battles going on during this time. The first is the battle between Luke Skywalker’s inner self–should he stay good or go over to the dark side of the Force. Then there’s the battle between Father and Son. Third we have the fighting on Endor with the Rebels and Ewoks against the Empire. Lastly, there’s the space scenes lead by General Lando Calrissian as they take on the Imperial Tie Fighters, Star Destroyers and ultimately, the Death Star itself. Now, I’ve only included a video with the space scenes, because, well, multiple explosions make me giddy. Enjoy! If you created a Storming the Castle list, would this scene be on it? Which scenes would you include? Leave a comment and let me know. I really would love to know what movie scenes you’d include. I want to take a moment to thank all of my readers who have purchased a copy of my just released poetry collection, Freedom: Poetry From A Life. If you haven’t purchased your copy yet, feel free to do so at either CreateSpace.Com or Amazon.Com. And yes, I have a few sci-fi projects coming soon. I will keep everyone posted once I am closer to publication. Join me next week, when I continue my STCMS list with one of my favorite scenes from “Troy.” Starring Brad Pitt, Eric Bana and Orlando Bloom.